A website that promotes the MPB Today “grocery” program is targeted at Spanish-speaking prospects and uses Walmart’s name in its domain name. Like at least three other websites linked to Florida-based MPB Today’s 2×2 matrix cycler, it is unclear if the site’s operator has Walmart’s permission to use its name in a domain name. The site, which implies Walmart distributes cash, is not registered in the retail giant’s name. An English headline on the site urges viewers to “Eliminate Your Grocery Bills . . . Forever” by joining the MLM. 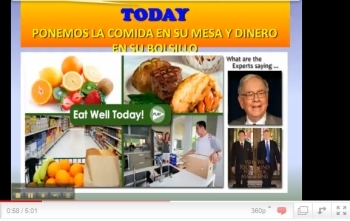 The site then presents Spanish content, while linking to a video that uses images of business titans Warren Buffet and Donald Trump. 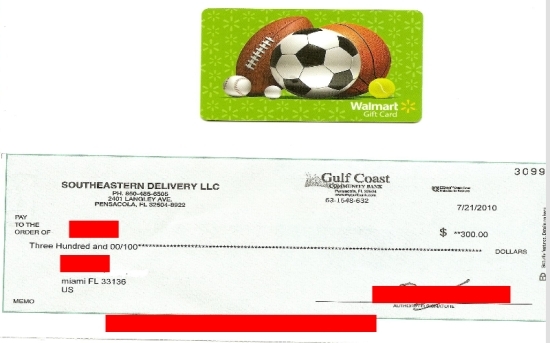 A check drawn on the account of Southeastern Delivery is reproduced on the site, as are images of a Walmart gift card, a Walmart store and a Sam’s Club store. MPB Today removed images of Buffet, Trump and Walmart from the homepage of its website last month. Regardless, multiple MPB Today affiliates continue to use the images. Southeastern Delivery is MPB Today’s purported parent company. It is common for MLM participants to imply a “program” is endorsed by celebrities and famous companies. The check reproduced on the website is drawn on a bank that has been operating under a consent agreement with the FDIC since January. Walmart and the FDIC have not responded to a request for comment from the PP Blog on the MPB Today program. Neither has the bank upon which the check is shown to be drawn. Multiple MPB Today affiliates have produced check- and card-waving videos and websites to recruit prospects. Some of them have been online for months. MPB Today has been advertised on forums that promote Ponzi schemes, including the now-defunct ASA Monitor forum. Some MPB Today affiliates have claimed publicly that there are liars, thieves and scammers in the organization. Patrick: From your statement “Some MPB Today affiliates have claimed publicly that there are liars, thieves and scammers in the organization.” I didn’t know that Andy Bowdoin and Phil Piccolo were in this one. Thanks for the heads up. Can’t wait for Bruce to show up and challenge this report. When I read articles like this, it gets me madder than hell. Not content with trying to take the english speakers for a ride, the unscrupulous promoters at MPB Today are now trying for the spanish speaking community who will have difficulty in doing their due dilgence, as there is not very much ab out MPB today in their language apart from HYPE. They are also amongst the more disadvantaged communities and need their money safe. Regrettably the naysayers send out their warnings in english. We need to get multilingual guys!